Western blot analysis of Jurkat cell lysates (#9194) treated with either U0126 (MEK 1/2 inhibitor) #9903 or TPA (12-O-Tetradecanoylphorbol-13-Acetate) #4174, using Phospho-p44/42 MAPK (Erk1/2) (Thr202/204) (D13.14.4E) XP® Rabbit mAb #4370 detected with Anti-rabbit IgG (H+L) (DyLight™ 800 Conjugate) #5151 (green) and p44/42 MAPK (Erk1/2) (3A7) Mouse mAb #9107 detected with Anti-mouse IgG (H+L) (DyLight™® 680 Conjugate) (red). 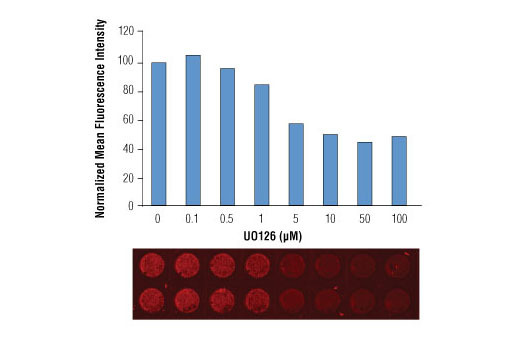 The array image pixel intensities obtained using a LI-COR® Biosciences Odyssey® Infrared Imaging System are shown in the top figure while corresponding fluorescent western blots are shown in the bottom figure. In-Cell Western™ analysis of A549 cells exposed to varying concentrations of U0126 (MEK1/2 Inhibitor) #9903 for 3 hours, followed by TPA (Phorbol-12-Myristate-13-Acetate) #9905 stimulation for 30 minutes. With increasing concentrations of U0126, a significant decrease (~2.5 fold) in Phospho-p44/42 MAPK (Erk1/2) (Thr202/Tyr204) (E10) Mouse mAb #9106 signal as compared to the TPA-stimulated control was observed. Data and images were generated on the LI-COR® Biosciences Odyssey® Infrared Imaging System using Anti-mouse IgG (H+L) (DyLight™ 680 Conjugate). Supplied in 100 mM PBS, pH 7.2, containing 1% BSA and 0.02% sodium azide. Store at 4°C. Protect from Light. Do not freeze. Anti-mouse IgG (H+L) was conjugated to DyLight™ 680 fluorescent dye under optimal conditions and formulated at 1 mg/ml. Excitation is 684 nm and peak fluorescence emission is 715 nm. Anti-mouse IgG (H+L) (DyLight™ 680 Conjugate) reacts with heavy and light chain of most mouse immunoglobulins. 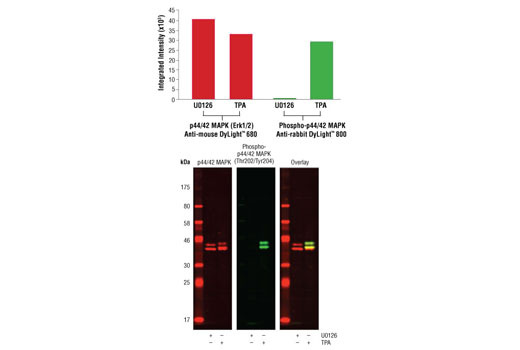 No cross-reactivity to other serum proteins has been detected. This antibody may cross-react with immunoglobulins from other species.